It was right around this time last summer when the University of New Hampshire became the first school to offer Aliza Simpson (Londonderry, NH) a scholarship for basketball. The 5-foot-8 point guard and incoming senior at Londonderry High has now accepted that scholarship, putting an end to the recruitment of one of the top guards to come out of NH in recent years. Simpson is a 3-year varsity player, a 2-time D-I first team all-state player and she has helped lead the Lancers to the Final Four 3 times in 3 years. Although Simpson ultimately chose UNH, there were many schools who were recruiting her. "This AAU season will pick back up in July during the Division I viewing period" Simpson explained. "June has been pretty low key as far as tournaments go, giving people time to visit schools, attend elite camps, and just work on their game. It takes a lot of time to go through the recruiting process because as soon as a coach identifies you as a potential recruit, they get in touch with you via mail/email/phone (according to the NCAA guidelines) and they then want you to visit their school to meet the coaching staff and players, tour the campus, and ideally take in a game or a practice. Obviously you can’t get everywhere so you have to try to limit it to those schools you really have an interest in. It can be pretty overwhelming at times. I tried to be as honest as I could with each school as early as I could. I was in discussions with pretty much every school in the Patriot League (Army/Colgate/Holy Cross/Lehigh/Navy) and with many schools in the America East (like UVM, UMass) and Northeast Conferences (Wagner/Central Connecticut/Siena/Sacred Heart)." Simpson weighed all of her options, but ultimately decided that UNH would be the best fit for her. "Heading into the summer, I was able to narrow things down to Davidson, URI, and UNH, and I then officially committed to UNH on Tuesday, June 25th" said Simpson. "From the first time I visited UNH, during my sophomore year, I felt an instant connection to the campus and the coaching staff. Thinking back, I just knew it was the school for me. The coaching staff is unbelievable and I got along great with the girls when I got to play some “pick up” ball and attend a homecoming football game with them. Since UNH was the first to offer me a full scholarship, I had nothing to compare it to. I wanted to make sure I took my time in exploring all options. They were very supportive in giving me the time and space to do just that, yet they always made me feel like such an important recruit for them by keeping in touch with me, coming to my high school games through the winter, and even my soccer games in the fall. Every school I visited after that, I always had to ask the question, 'what would this school give me that UNH wouldn’t?'. It’s just such a great fit for me in so many ways." Simpson becomes the third player from the NE Crusaders AAU program to join the New Hampshire women's basketball team since Maureen Magarity took over as head coach in 2010. The others are Kristen Anderson and Elizabeth Belanger, who are from Maine and Massachusetts, respectively. "I’m excited that I’ll be able to play with a few other Crusaders like Kristen Anderson and Elizabeth Belanger" Simpson pointed out. Coming out of such a high level program like the Crusaders, these girls have been up against the best of the best in the country, and they’ve been part of a very disciplined system. Kristen and I played together on the NIKE team last year, so I know that we can work well together. Plus, she’s a ton of fun. I have not played with Elizabeth but I have seen her play many times. I like her work ethic and her ability to shoot." Simpson has been coached with the Crusaders for the past few years by Mike Collins, who concurs that New Hampshire appears to be a good fit for his star pupil. "I was a fan of the UNH choice" Coach Collins said. "I think she can play there early and together with Kristen Anderson and some of their other recruits will bring a more up-tempo style that I think the young staff their is eager for. I think it's a perfect fit." UNH's campus in Durham being so close to home also played a major factor in Simpson's decision. "The best part of playing basketball at UNH will be that my parents can be in the stands" said Simpson, who is the daughter of David and Amy Simpson. "My parents have been so supportive in everything I do and with them being able to watch me play is a huge positive and I’m so happy for that. UNH is forty minutes from home so it is an easy ride to get home and back - and no traffic!" 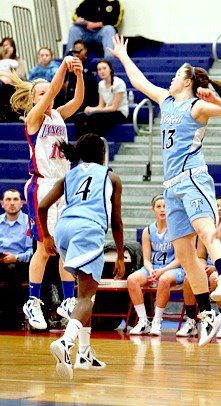 Simpson's parents were involved with basketball while she was growing up, which helped her become the player she is today. "It’s funny because when I was young, even though I played 'rec' and 'travel' basketball, I was focused more on soccer" explained Simpson. "I thought that’s what I was going to be when I was older and I thought I would play soccer in college. But I had an injury to my knee because of the uneven surface of the soccer field and I began playing basketball at a more competitive level. It was a pretty natural transition as I had always been around the game so much when I was younger; I practically lived at the Sportszone and various gyms when my dad would referee. I started basketball in third grade with my mom being my coach. I owe a lot to her, she has always been there to support me. When I decided to play AAU, I played for Danielle Paradis on the Shooting Stars. She helped me take things to the next level. She led very skills-based practices (picture us wearing 'dribbling glasses' to become better ball-handlers by not looking at the ball). I remember being 10 years old traveling down to Disney’s Wide World of Sports with that team for Nationals. It was so much fun. When I transitioned to the New England Crusaders and we started playing a national circuit, it pretty much solidified that I wanted to play Division One basketball. Coach Mike Collins really provided all of us the tools to be successful. He held so many skills sessions, shooting sessions, and strength/conditioning sessions…it was just a matter of what level you wanted to plug into in order to improve your game. He was always researching the next best methods of training. He pushed me and gave me so many options to become a better player." Coach Collins saw the potential in Simpson when she was in middle school and helped take her game to the next level. "I started coaching Aliza in about 8th grade" said Collins. "It was clear from the first time I saw her play, even before I coached her she was a special player. I'm an ex-player, and while ex players are sometimes lousy coaches, many of us have a pretty good eye for talent. But with her it didn't really take much if an eye. She has the physical tools, with a big time handle and as quick of hands as I've seen in a female player. She also has swagger, confidence, and a certain 'it' factor that the great ones have." Simpson has many fond memories from over the years with the game of basketball, particularly with her Crusader coaches and teammates. "Even though I love the thrill of the game itself and when I step on the court, I just want to go 'all out', one of the best parts of the basketball journey for me has been the friendships I have formed along the way" Simpson explained. "I have had the best teammates. In fact, there are two players that I have played with on every AAU team I have been on (Mckenzie Brown and Courtney Walsh). Those are friendships for life. I have had the opportunity to play with the best talent across New England, and I couldn’t have chosen better people to play the game with. The Crusader organization has been such a great family for me. Each coach brings something different to the team. I spoke about Mike Collins being my first Crusader coach already, and now this year we’ve been playing under Maureen LaRoche. She is the most positive person you will ever encounter. Playing for her is so fun and she just makes you feel so good about yourself. She pushes us so hard at practices and is so intense! …she just brings great energy to the gym. One of the great things about being involved with the Crusaders is that you get so many opportunities to be coached by other coaches in the program (like Kara), and they also try to bring back former players to add another level of experience. Stef Murphy is one of our bench coaches in July, and she brings so much knowledge of the game and also relates to us so well. …love her! She was a senior at my high school when I was in the 4th grade, and she’s always been such a great leader, role-model, and inspiration." Murphy and Simpson are just 2 of the 50+ scholarship players that Londonderry High's legendary head coach John Fagula has coached over the years. "As my high school coach, Coach Fagula is one of my favorite coaches" Simpson noted. "I respect him so much. He is such a legacy from everything that he’s been involved with in the past. He is always very eager to share his knowledge and his experience. He’s also been very careful to make sure that I don’t put too much pressure on myself. He truly cares about his players and I’m lucky to play for him." Simpson is a wizard with the ball in her hands - she has a great handle, knows how to control the tempo, when to shoot it and when to kick it to the open teammate. She's a very good passer, defender and is a flat out winner. Coach Collins recalls his favorite moment from coaching her. "I remember one play in particular in the third place game at AAU nationals in Ohio" explained Collins. "We were down one with less than a minute to go. She makes an unbelievable steal, gets fouled and hits the free throws without missing a beat. We win by one. Big time players make big time plays. That was her game for me in a nutshell." You can bet Simpson will make plays like that once she gets to UNH. First she has her senior season left to play at Londonderry when the Lancers will once again be one of the favorites in girls D-I. "When I reflect on the journey that basketball has taken me on so far, I feel so blessed" Simpson concluded. "It has allowed me to travel to interesting places, to form lasting friendships, to learn from some great coaches - and it’s only just beginning. I am very excited to play in college. 10 days after I graduate, I will be off to UNH to start a new chapter with my college teammates. I can’t wait to see what’s in store for me there. I will work as hard as I can to have a positive impact on the program in my home state."